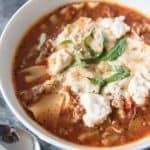 One pot lasagna soup has all the wonderful cheesy, meaty richness of a lasagna, but in soup form! It's easy and a perfect, hearty soup for a cold day! In a dutch oven or large pot, combine the Italian sausage, ground beef and onions and brown over medium heat, breaking up the meat into small chunks while it cooks, until meat is no longer pink. Add the minced garlic right at the end and stir into the meat and onions, cooking for another 30-60 seconds and drain any excess fat from the pan. Add 6 cups of the chicken broth, crushed and diced tomatoes, tomato paste, chopped carrot and zucchini, and all the herbs and spices and give everything a good stir to combine, then bring to a boil, about 15 minutes, while the flavors combine. Once the soup is boiling, add the broken lasagna noodles and let them cook until al dente (about 8-12 minutes). Discard bay leaf and stir in the remaining 2-4 cups of chicken broth until the soup is at the consistency you like it. Top with the mozzeralla and Parmesan cheese and divide into bowls. Drop small dollops of Ricotta cheese over the top of each serving and sprinkle with a few strips of basil for garnish. If you anticipate having leftover, remove the portion of the soup you think will not be consumed immediately prior to adding the lasagna noodles for cooking and put it in an air-tight container in the fridge (or even freezer for up to 2 months). When ready to serve, place the reserved portion in a pot, bring it to boiling, then proceed with the recipe as directed, adding the lasagna noodles to cook, then the cheese, etc.